One of the easiest things to prepare that's also healthy for you are salads - grab some fresh greens, a protein source & loads of veggies & you can throw together a simple lunch or dinner very quickly. It is the ultimate combination of fresh greens, some quality protein and lots of fiber to keep you going throughout the day. It is totally customizable and can be made into several batches for the week. There are many ways to assemble and season a chicken salad but this recipe gives you a quick and no-fuss method that is very simple to make and very tasty. The only seasoning here is balsamic vinegar which gives a very nice sweet and sour flavor and brings everything to life. There are also a variety of options for sides on this salad that make it even more satisfying and nutritious but one of our favorites is hummus. The nutritious chickpeas make this salad a well-balanced and healthy meal that will help satisfy your appetite for hours. The great balance between fiber, protein and vitamin quantity is what makes this salad the perfect to-go option. It can also be made into a vegan or vegetarian option by omitting the meat and adding in some more hummus or quinoa. Be generous with the greens here – they are a powerhouse of minerals and nutrients. Dark leafy greens are also a very good source of protein, iron, vitamin C and K and various antioxidants. Pile your green salad as high as you like! The other things is to be liberal with whatever other kind of veggies you like. Did we leave out your favorite? Add it! You don't have to worry about recreating the dish exactly; make it your own, make yourself a dish you will enjoy eating. If you make a big batch of this salad make sure to store it in an airtight container in the fridge for up to 4 days. It is also the perfect picnic and travel food (it makes a great packed healthy lunch for work). 1. Soak the chickpeas in lukewarm water overnight. 2. On the next day rinse the chickpeas and put them in a saucepan with 1 liter of water. 3. Cook for 1 hour or until soft and tender. Rinse and set aside. 4. Rinse the quinoa and cook it with 1 cup of water for 15 minutes. 5. Rinse and set aside. 6. In a food processor put cooked chickpeas, tahini, garlic, cumin and lemon and blend. 7. On a baking tray lined with parchment paper place the chicken breasts. 8. Season with salt and pepper and roast for 10 minutes at 180˚C. 9. Remove from the oven and slice. 10. In a big salad bowl put the rinsed and chopped spinach leaves, cooked quinoa, slices red pepper and chopped walnuts. 11. Season with the balsamic vinegar and toss everything together. 12. In a serving dish place salad, arrange some chicken sliced on top and garnish with 2 scoops of the hummus on the side. Note: For a vegan option omit the chicken in the recipe. Our 4 Week Bodyweight-Only program is perfect for at home workouts; you won't need any equipment for these challenging & highly effective HIIT cardio, bodyweight strength training, Pilates and flexibility workouts. Ten very effective minutes of upper body strength training fly right by in this fast paced workout that uses our signature bored easily format. 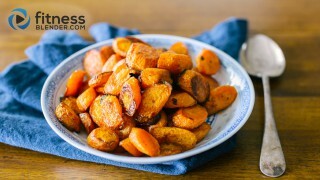 A simple, easy to make side dish that's bursting with flavor and vitamins.